Delta Rae - September 16, 2018, 7 p.m.
Artrageous - September, 30, 2018, 7 p.m.
Tito Puente, Jr. y Melina Almodovar - October 21, 2018, 7 p.m.
Ukraine’s Kurbasy - November 3, 2018, 8 p.m.
Ruthie Foster - January 19, 2019, 8 p.m. Lesson Plans to Late Night - January 27, 2019, 7 p.m.
PHILADANCO - February 8, 2019, 8 p.m. Underwater Bubble Show - February 28, 2019, 5 & 7:30 p.m.
Italy’s NEWPOLI - March 29, 2019, 8 p.m.
Joan Osborne - April 13, 2019, 8 p.m.
Performance/rehearsal rates set forth for the rental of the performing space in the Center are per hour, with a four-hour minimum. Buckman technical, security and maintenance staff are required for all rental performances . The technical attendant will advise and make sure the stage is ready for renter. Any additional technical needs must be arranged in advance and incorporated into the written contract. Renter may choose to provide their own qualified technical support for their event. It is left to the Buckman directorʼs discretion to determine if supplied technical staff is competent to utilize theater equipment. Licensee is required to pay for all attendant services in addition to the hourly rental fee. See policy booklet for details. Allow ample time to complete your activities to avoid overtime charges. Rates are subject to change. Personnel fees are subject to availability. Download the Buckman Technical packet. The William H. Rose Theater seats 288 in a sloped floor arrangement. 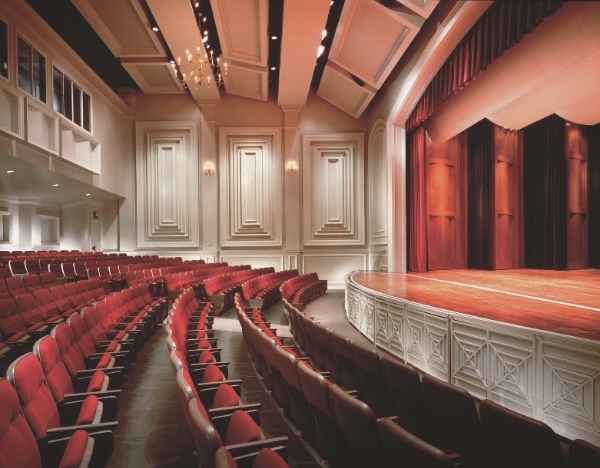 The decorative and acoustically engineered wall treatments create a rich blended acoustical tone in the theater. A complex system of catwalks, rigging and adjustable lighting support a variety of performances. The main stage area has a resilient "sprung" high-quality, wood floor, as well as a sectional marley covering for dance performance. For information, call (901) 537-1486. "We like to say that the star of our show is our intimate stage and comfortable house. Our acoustics are sublime, sight lines are amazing and the seating is comfortable with wide aisles. Only at Buckman can audiences get this close to the artists. Every show is a once-in-a-lifetime interaction between performers and patrons."